Test Intake and Exhaust Runner Lengths and Diameters. Intake Runner Bellmouths and Manifold Plenum Modeling, Port Area and More! Diesel Modeling with Compression Up To 30:1. View Graphs of Intake & Exhaust Pressures, Velocities, Mass Flow, Cylinder Trapped Mass, BSFC, and Much More! Outcomes Based On Your Selection Criterion! P-V Plots, Include Custom Variables! To Excel And Other Applications. Imports All Previous-Version Dynomation files. Get Up and Running In No Time. Dynomation-6™ with ProTools™ is a professional engine simulation package used by engine designers and professional shops worldwide. The software lets you peer inside a running engine! It reveals (otherwise invisible) pressure waves and mass flow within cylinders and engine passages. Dynomation-6 accurately displays how much power an engine will produce, and its pressure and particle velocity displays will show you why it makes that power and where you should put your efforts to optimize performance! Unique Direct-Click™ data entry let's you select and modify any component with just a mouse click! Also includes FREE (for a limited time) CamDisk with 6000+, 10-point camfiles AND a COMP Lobe-Profile library CD of 3500+ lobe-profiles (another Motion First!). You also receive all current program updates and all FUTURE version-6 updates! Plus, you‘ll get Motion Software's top-tier technical support. We're here to help you get the most from your simulation investment! Use Dynomation6 to quickly zero-in on the best combination for professional racing, performance or economy. Guaranteed! Single-User License (Install Dynomation6 on as many computers as you wish; program will run on computer with USB Security Key plugged in). Includes FREE CamDisk With 6000 10-Point Camfiles and a 3500+ Lobe Profile File Library CD (A Hot-Rod Industry FIRST)! All Current and Future Version-6 Updates FREE! Fully Compatible With Windows Vista and Windows7, 8 and 10 (32- and 64-bit). NEW COMP 3500+ Lobe-Profile Library CD. Add $9.95 shipping for US locations ($19.95 outside the US). To US Locations. DynomationTwoStroke™ is a full-cycle, two-stroke engine simulation. Use it to model a wide variety of two-stroke engines using Piston-Port Induction, Reed-Valve Induction, or Rotary-Valve Induction systems. It also includes advanced Air/Fuel ratio and BSFC modeling to help you build the highest power and longest engine life. DynomationTwoStroke will produce solid, accurate predictions of engine performance characteristics that you can use to optimize your next 2-stroke project engine! Single-User License (Install DynomationTwoStroke on as many computers as you wish; program will run on computer with USB Security Key plugged in). All Current and Future Version 1.1x Updates FREE! Requires Windows98 or Windows XP (32-bit). Special Note: This program requires Windows98 or WindowsXP (32-bit only). It uses DOS functionality built into Windows98/XP to display screens, menus, etc. (download User Manual for a further explanation and to see screens and menus in DynomationTwoStroke). Evaluate Cylinder Heads, Custom Port Flow, Cams, Intake Manifolds, Headers, Mufflers, More! Carburetors or Injection, Custom Fuels, Turbos, Superchargers, Intercoolers, Test Any RPM range! View Graphs of Pressures, Velocities, Mass Flow! Run Automatic Iterator™ Tests to Find Best Combinations! Run Back-to-Back Tests, Comparison Graphs! Imports all previous-version DynoSim files. Built-In Calculators Make Flow, Cam Timing, Compression-Ratio and Other Computations Easy! DynoSim6™ is a highly accurate engine-dyno simulation, built from the ground up to be easy to use. If you know engines, you’ll be building horsepower with this simulation in just minutes. Assemble and evaluate any engine you can imagine. Click on any component, select from pop-up menus or enter your own custom specs. DynoSim6 instantly displays power and torque, fuel flow, airflow, frictional losses, and much more! Use DynoSim6 wave displays to “see inside” your running engine! Minimize intake reversion, correct miss-timed exhaust pulses, locate flow restrictions. Software also models turbochargers, roots/screw and centrifugal superchargers. Set boost, belt ratios, turbine sizes, A/R ratios, even model intercoolers. Known worldwide for accuracy and ease of use, DynoSim6 will help you get the most from any engine. And count on Motion Software for top-tier support to help you when you need it! You’ll even find additional engine files, cam files, and cylinder-head flow files on the Internet! 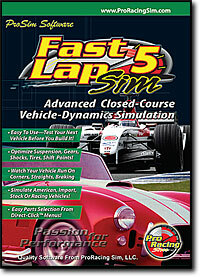 DynoSim6 is, simply, the best simulation for the money, and it’s fun to use, too! Includes FREE CamDisk With 6000 10-Point Camfiles, and a 3500+ Lobe Profile File Library CD (A Hot-Rod Industry FIRST)! From DynoSim4/5 or Dyno2000 Engine Simulations! Must be a registered user of previous engine simulation. Build, Test, And Drag Race Any Vehicle! Curve From Any Real-World Engine! Acceleration, Aero Drag, Tire Slip, and more! Built-in Traction Calculator™ optimizes tire/track friction modeling. Determines the most accurate adhesion model, automatically! Optimize Any Vehicle BEFORE You Build It! Built-In QuickIterator™ Finds The Best Shift Points And Gear Ratios, Automatically! Accurate, Easy-To-Use, State-Of-The-Art, And Fun! DragSim5™ With ProTools™ is a comprehensive 1/4- and 1/8-mile vehicle dynamics simulation. Use the simulation to design and build any car, motorcycle or dragster and accurately evaluate its performance at simulated dragstrip! Enter any engine power curve, or test engines you've designed in DynoSim6 or Dynomation6 (you can even test a variety of jet and rocket power plants!). Test any manual or automatic transmissions, any gear ratios, any vehicle weight, wheelbase, driving style, traction and weather conditions and more! Change components with just a mouse click—drag-race times are instantly updated. A PopUp TimeSlip™ provides an easy-to-read visual summary of overall vehicle performance. Nothing could be easier! Includes powerful Iterative Testing™ that runs multiple tests and finds the best gear ratios, shift point, and more for any performance or racing applications, automatically! DragSim5 is a great way to evaluate any simulated and real egnine, and it‘s fun to use, too! Fully Compatible With Windows Vista and Windows7, 8 and 10 (32- and 64-bit. Test Any Simulated Or Real-World Engine On Any Closed Course Track or Skid Pad. Watch Real-Time “Hot Laps” From Overhead Track View; Zoom In To Catch All The Action! Use Any Of 40+ Built-In Tracks Or Build Your Own With Included Graphic Track Editor™. Build and Test Stock Cars, Street Racers, Race Sedans, Nascar, Open-Wheel Vehicles. Build Coil Spring, Strut, Torsion Bar, A-Arm, Or Swing Suspension Systems! Brake hard into a turn...then nail the throttle and send the engine through its power curve in each gear...once again slam on the brakes and dive into the next turn...now, repeat this one hundred times! Evaluating suspension, tires, gear ratios, camshafts, headers, and the hundreds other components that make up a competitive road-course vehicle is what FastLapSIm5 can do!. Lets you accurately simulate vehicle components, try unique combinations, and test the entire race car before you twist a single wrench. Modify any component in seconds and run back-to-back tests to “home in” on the ultimate setup for any vehicle and track (you can even design custom tracks or skid pads!). Accurate, easy-to-use, state-of-the-art and great fun; FastlapSim5 is an awesome simulation that, we are sure, will become a valuable addition to your racer’s toolkit.